Amusements, diversions, whirligigs, geegaws, humbugs and comics, comics, comics. I will have a very limited number of copies of a new complete collection of Monkey’s Paw, my insane collaborative monster comic with Ben Zmith (along with almost 60 pages of bonus materials) available this Sunday (August 18th) at the Autoptic festival in Minneapolis. Really, this print-on-demand edition was printed to promote the comic to publishers who may be interested in publishing it… but I’ll be selling some of them. We’ve done a first printing of 20 copies, many of which are already gone. I will gladly draw something in the book for anyone purchasing one… the book will run you 12 bucks. In the event I sell out of them, or if you just prefer reading comics digitally, you can read them all online at our website at webcomix.org/monkeyspaw… so I suppose you should really consider saving your money for the enormous quantity of other incredible comics that will be available at Autoptic this weekend, anyhow. 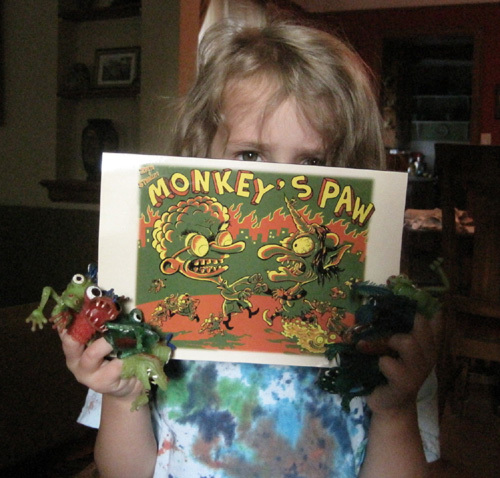 Regardless, please stop by my table for a free sample Monkey’s Paw mini-comic if you’re inclined… I’ll have a lot of other self-published stuff available as well, including my big collection of Soapy the Chicken (soapythechicken.com) webcomics (which I am looking for a publisher for as well). This entry was posted in Collaborations, EVENTS, Monkey's Paw, STWALLSKULL's Comics by STWALLSKULL. Bookmark the permalink.